yay it’s Friday 🙂 I am only popping in for a very quick recipe share. I am a bit in a hurry as I have a qudrillion of tasks on my to-finish-today list and there is a ceremony at the university today starting at 11 am and one of my colleagues convinced me that it was necessary to go there. BUMMER! It’s just plain stupid. I have no time but need to go somewhere I don’t want to go only because my boss might notice that I am not there and might wonder where I am. Easy answer. As I am practically covering half of my colleagues job I am elbow deep in a swampland of tasks. Yes there was a recipe I wanted to share with you guys. You should really give this oat recipe a try. It’s so yummy! The texture is just lovely. 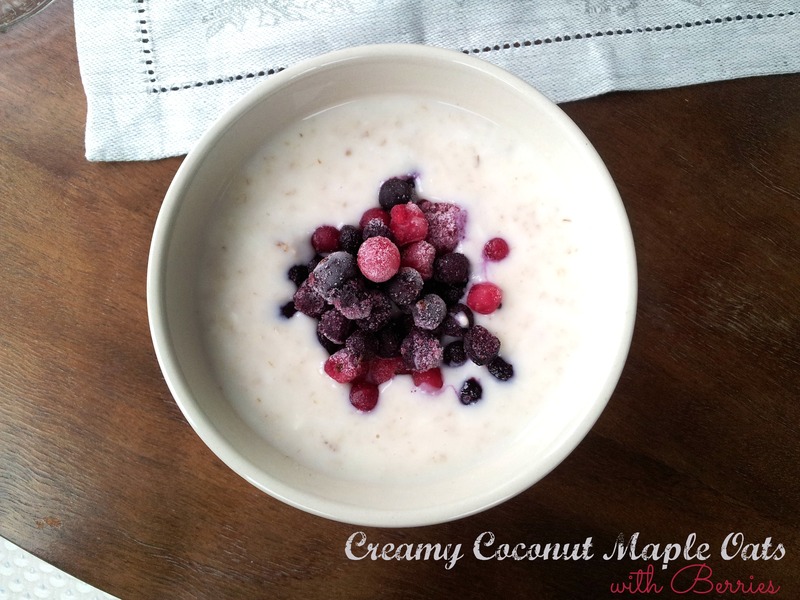 So very creamy with a bit of texture provided by the coconut. And the maple syrup just addes the right amount of deep malty sweetness. Delicious! A little hazelnut butter or almond butter as a topping is also a yummy addition. What’s your quick and easy breakfast recipe? Have a nice Friday lovelies! I really need to dash now. Mmmm…coconut and maple syrup sounds divine! I’ve never thought to combine coconut and maple syrup- you have me tempted! I actually have a huge oatbran craving so tomorrow it shall be satisfied! It shall definitely be satisfied! You should try this combo. It’s so good! Yummy! This sounds wonderful! I will definitely be giving it a try when I forget to put oats in overnight! I love my cereal for on a rush day, but I do like oatmeal too! Cereal is nice too. But I struggle to find a no sugar brand here! I practically love any kinds of breakfast food! This looks so warming and delicious! I’ve not gotten back into my oatmeal yet for winter since it is still technically spring here but the weather is so friggin cold already I really should 😉 I love mine with honey, cinnamon and sometimes nut butter. I agree that oatmeal is a winter breakfast. In summer I find myself turning more to smoothies and other cold foods. Honey, cinnamon and nut butter sounds divine! I’ll definitely try this with my next oatmeal 🙂 Thanks for the tip! I love the addition of maple syrup and berries. I’ll never say no to berries. Berries are my favorite fruit ever! I can’t wait for picking stawberries and blueberries and just stuff my face with any berrie I can get my fingers on! This sounds great and I will try it next week. First get some maple sirup. This looks super good! I unfortunately still have yet to obtain maple syrup, but this may have to happen in the near future so I can try this out!